After months of tweeting, networking, meetings, editors, editing, writing and generally spreading the word, the day has finally arrived. At midnight tonight, book two of the Scarlet Hopewell series releases to fans and those who soon will be fans and I will admit, I'm even more excited than I thought I would be. 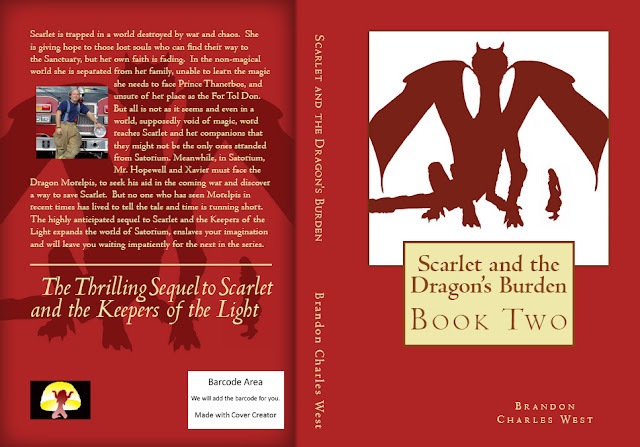 Scarlet and the Keepers of the Light received such an enormous welcome and positive response and in my humble opinion, in The Dragon's Burden it only gets better. Unfortunately, actually fortunately, for those of you who have not read Book one, you'll be a bit lost if you try to start with Dragon's Burden. But the good news is you can read Keepers and Dragon's back to back without having to wait. I can not thank my fans enough for the support I have received for this series and although I will admit that I would write the books even if my daughter was the only one anxious to read them, you all have made the experience so much more exciting for me. I promise that I will work as fast as I can to get book three out so that the wait isn't long, but for the moment, I'm going to try and revel a bit in book two. Now, I know there might be a few of you out there who are on the fence about reading the series. After all, it is a young adult series and some of you, as much as you may hate to admit it, are no longer young adults. I, for one, am adamantly refusing to accept this fact about myself, but that's just me and after all, I am a fantasy writer so I get a bit of leniency. For those who are members of this fence balancing public, I have included a preview of the preface at the bottom of this post and a few assurances. There are adults in the book and unlike some popular young adult novels, they play a prominent role in the story as fully developed characters experiencing adult emotions. Fatherhood, family, and loss are woven within the book as the characters struggle with fantastical events, war and unimaginable fear. There is also magic, a dragon, coming of age, acts of heroism, inner strife, self doubt, and learning to find the strength to do the impossible. I promise to pull as much at your heart strings as a do challenge your imagination. A couple reminders before I end this post. This website has a lot more to explore than just this post. There is a draft of my map of Satorium, a page for the kids and a bit more about myself and my others books (two just for the non young adults). Please take the time to check out some of the other areas and join the blog so that you can get updates as they come. Also, if your a facebookie type, despite having quite a lot of traffic to my fan page, www.facebook.com/fortoldon, people always forget to hit the LIKE button. Don't be one of those people. Every LIKE helps bring more people to the world of Satorium. I hope you enjoy Scarlet and the Dragon's Burden even a fraction as much as I did writing it. As always, thank you for reading. Hulpric the Great sat on the shore, the sand under him stark white and soft, the clear blue water washing against his bare feet and teasing at his toes. The sorcerer was tall and his shoulder’s broad. The angular face was thin, with strong, sharp lines and a hawkish nose. His eyes glowed the color of polished emeralds, distracting from the wrinkles at their corners, the results of a life spent in observation of the world around him. A consummate traveler, Hulpric’s skin was deeply tanned from long walks in the sun and his cloak worn and unassuming. To anyone who didn’t know better, although most everyone did, the appearance of the Doran sorcerer was that of a humble, good-natured fellow who presented no threat to anyone or anything. Someone who would be good for a tale around the fire or for those less scrupulous, easy pickings for a scam or a mugging. The truth was that Hulpric was the most powerful sorcerer to ever walk the earth. Hulpric wore an expression of regret, of guilt and sorrow. His head, usually held high and proud, was bowed low toward the edge of the surf. His emerald eyes brimmed with unshed tears. The island had been one of his favorites and he had traveled here many times to enjoy the beauty of the sun-drenched beaches and rich palmed forests. Mostly he had returned, however, because of the people. He held a special place in his heart for the Islanders and their simple lives. The Islanders, more than any he called on, and Hulpric called on all who lived upon the earth, seemed to enjoy the gifts the world had given them with gracious contentment. They ate and laughed, they worked and shared, they loved and they sang. Their lives, seemingly bare and essential, were bountiful because of the manner in which they enjoyed them. No one on the island was of any great importance, as far as the Kingdom of Leona might be concerned, for instance. And yet, to each other, more so than any other culture Hulpric had known, each and every member of their community was cherished. They truly cared for one another. That was preciously rare, Hulpric had found in his travels. It was sad that it was so rare, but he had seen a great deal of the evil people could exact on one another, even on those who were members of their own families, or their neighbors, or countrymen. To Hulpric, the Islanders were an example of how things should be, or at least how he wished they could be. A large shadow passed over Hulpric but he did not look up. He had sensed the dragon’s approach long before and was neither surprised nor fearful of its approach. The massive scarlet beast circled overhead twice, before diving quickly down, landing with surprising delicacy on the beach beside Hulpric. “Hulpric,” the dragon called, his voice filled with sympathy. He seemed almost cautious in his approach. Morelpis crouched down beside Hulpric, lowering his mighty head so that they could speak without him towering over Hulpric. “How could I not, old friend,” Morelpis said solemnly. He glanced back toward the palm forest and then back at Hulpric. “Are they all…?” Morelpis couldn’t finish his statement, as if saying the words might hurt Hulpric even more than the situation itself. Morelpis snorted in anger, a small jet of flame escaping his throat. He felt a touch of regret for the lives of the Islanders, but Morelpis’s anger was for Hulpric and the pain his friend now bore. “Who did this?” Morelpis asked, not sure what else to say. “Doran slavers from South Satorium came to collect them. The islanders refused to go and put up a fight. They were no match for the slavers’ magic,” Hulpric said, his voice distant. Morelpis gave another snort. He would never understand why Doran’s took others as slaves. How they could look at members of their own species as property to be bought and sold? No matter how long he lived he would never understand. “Are you going to hunt them down?” Morelpis asked. Dragons were not usually ones for revenge, but he had known many Dorans in his long time on the earth and magic or no magic, most would seek out vengeance if they were capable. None were more capable than Hulpric. “To what end, Morelpis? I would destroy the slavers only to have them replaced by others. Those born without the gift of magic will never be at peace, no matter how thorough my vengeance,” Hulpric said, his voice rising with emotion. “Then what will you do?” Morelpis asked. Hulpric answered only with a long and charged silence. Morelpis couldn’t be sure whether the sorcerer was trying to figure out what he should do or whether to tell him what he had decided. Finally, Hulpric stood and turned to Morelpis. They headed toward the islanders’ village and weighty silence gathered again between them. The village had been destroyed as a warning to any who might oppose the slavers in the future. Ironically, there was no one left on the island to receive such a message. “Than what can you do? Listen old friend, this is not your fault. You can’t protect everyone,” Morelpis reasoned. “Yes…I can,” Hulpric answered cryptically. He looked over the carnage before him. The dead lying broken and discarded on the ground. Their lives forfeited without a second’s thought or a sleepless night by those who took them. Never again, he thought to himself. Never again. The tears brimming in Hulpric’s eyes began to fall.